This spectacular 6 bed 5 bath luxury villa with no rear neighbours, south facing pool, conservation views and 5* interior is located on the much sought after award winning Providence gated community. This home is furnished to a very high standard throughout and enjoys an open plan living area incorporating a top of the range kitchen and elegant dining area. 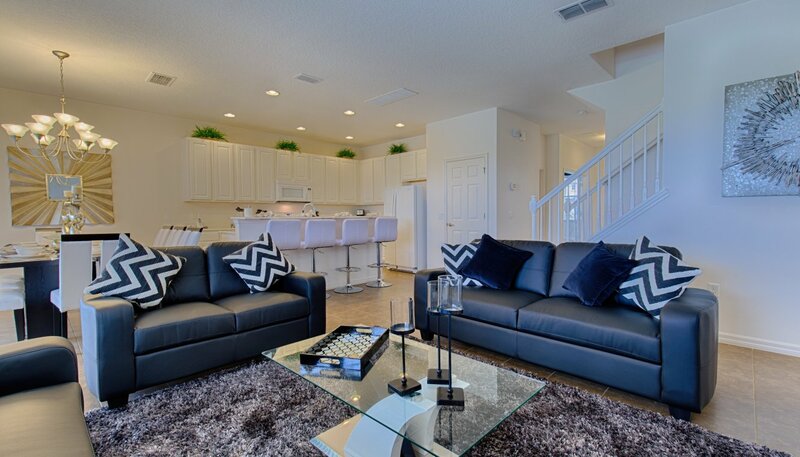 This and the upstairs loft area both have 60" 4k Smart Ultra HD flat screen TV's. 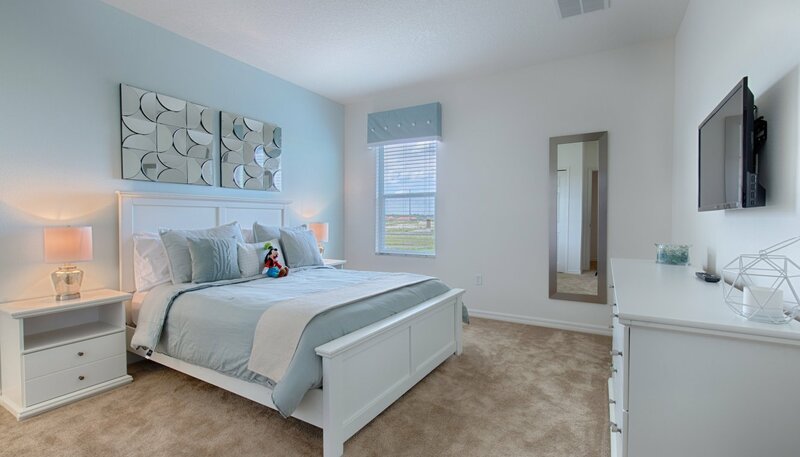 A "chill out" room, 3 Disney themed bedrooms, luxurious master suite, further king bedroom and queen suite all with wall mounted flat screen TV’s complete the home. There is also a fantastic games room, PS4, upgradeded cable package and free internet. Providence is a 24 hour manned gated community with its own golf course, gym, tennis courts, communal pools and childrens play area. Free unlimited local and long distance telephone calls to landlines in most countries. 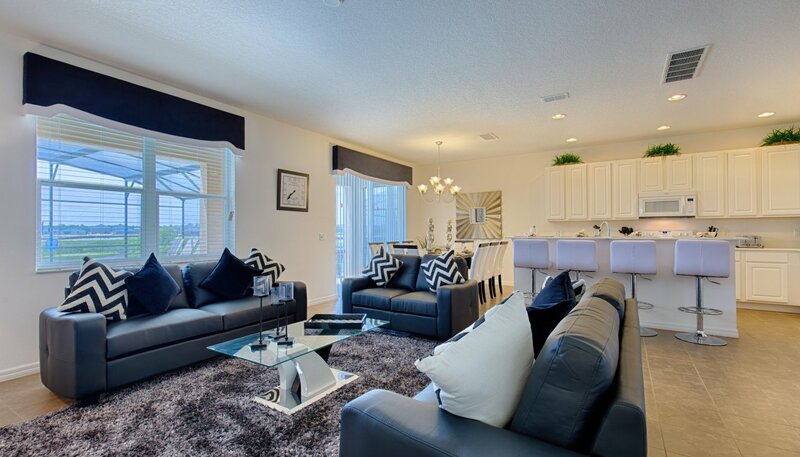 Open plan family room with 60" 4k Smart TV & Blu-Ray DVD player. 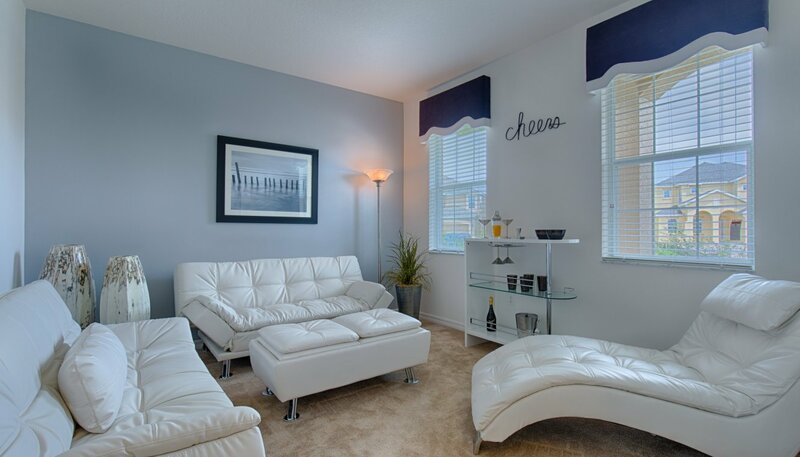 Chill Out room provides a relaxing & comfortable seating area to get away for a few hours. Heated swimming pool with poolside furniture, pool guard and pool cover. Laundry chute in the loft area so no excuse for dirty washing to be laying around!! 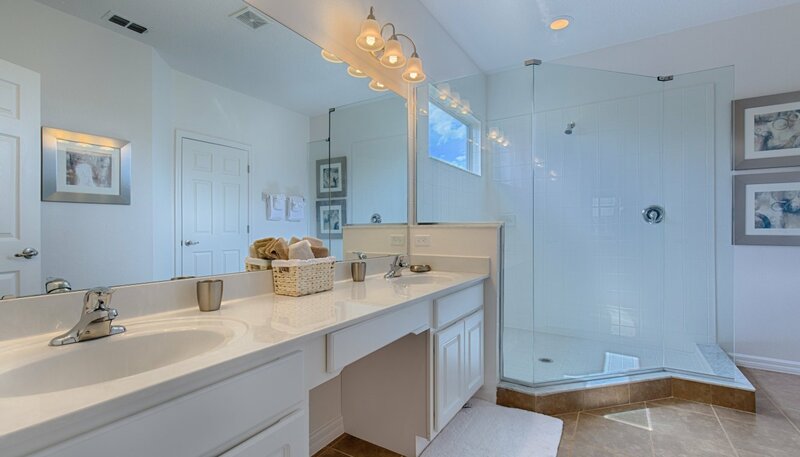 As you enter the home you are greeted with a fabulous tiled hallway with the "Chill Out" room to your right, followed by the laundry next door. On the left there is a door leading to the converted garage/games room. The hallway then leads onto the spacious open plan family room, kitchen and dining area beyond. The "Chill Out" room to the front aspect purposely has no TV as we wanted this area to be a room where you can just relax. We therefore added the optional doors so it can give complete privacy if required and the luxurious leather suite including a chaise lounge is the perfect way to unwind. There is a portable bar unit so you can even enjoy a drink if you so desire. The laundry room adjacent to the TV room provides a washing machine, tumble dryer, ironing board and iron for your convenience - enabling you to keep your luggage light so there is plenty of room for all those bargain designer clothes from the excellent local outlet malls. There is also a safe here, large enough to hold a laptop, so providing added security for leaving valuable items at home whilst you are out. 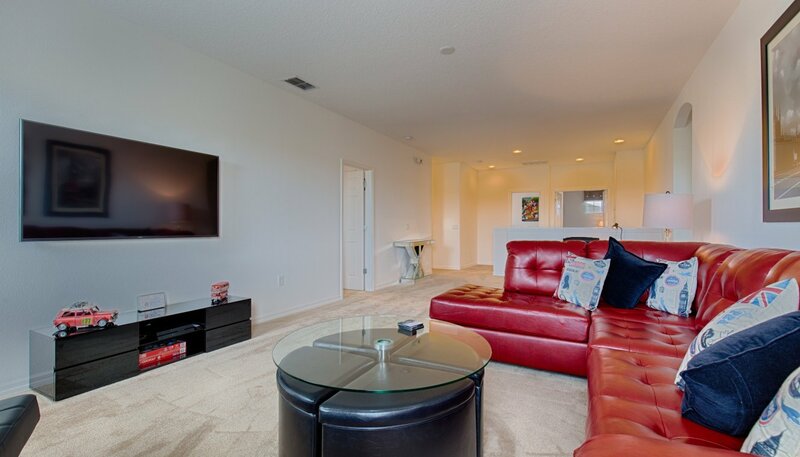 The contemporary luxuriously furnished room with pleasant views onto the pool deck and conservation area beyond, offers ample seating to relax and chat or watch the 60" flat screen TV with upgraded Ultimate Cable package or the Blu-Ray DVD player. 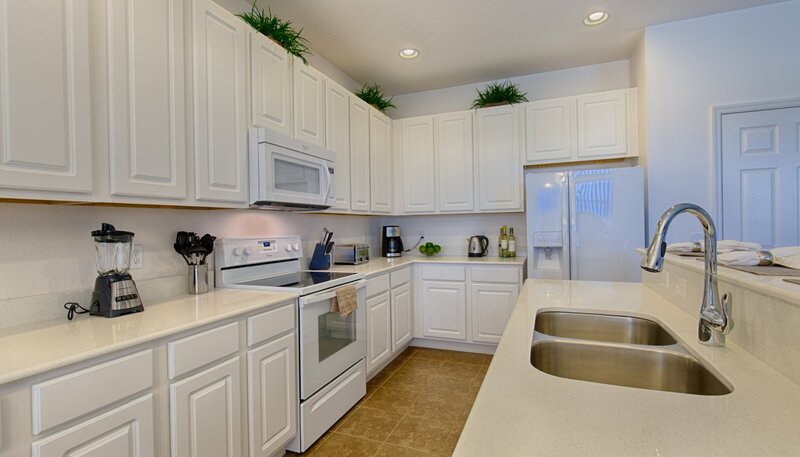 With upgraded larger 42" white maple units and white Viatera kitchen countertops the luxury kitchen has all the amenities including dishwasher, stove with oven, microwave, refrigerator & freezer with automatic water and ice dispenser, waste disposal, coffee maker, blender, toaster & kettle. 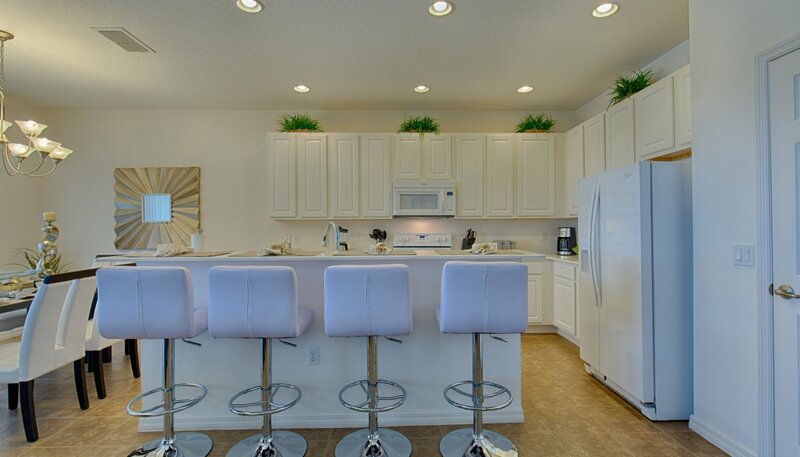 The breakfast bar has 4 comfortable leather bar stools. Adjacent to the kitchen in the corner with views & sliding patio doors onto the pool deck is the beautifully decorated dining area with large dining table with 8 chairs and is ideal for large parties and formal dining. With a central LED light in the dining table, it can also produce a stunning feature at night. 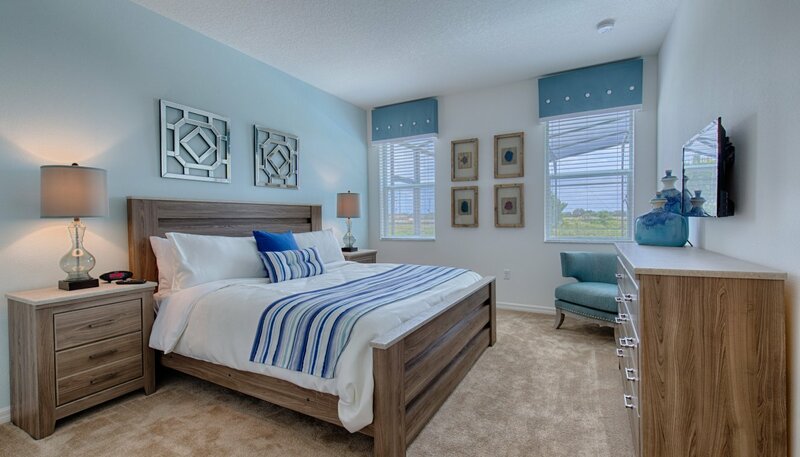 This bedroom features a king sized bed and has views onto the pool deck. 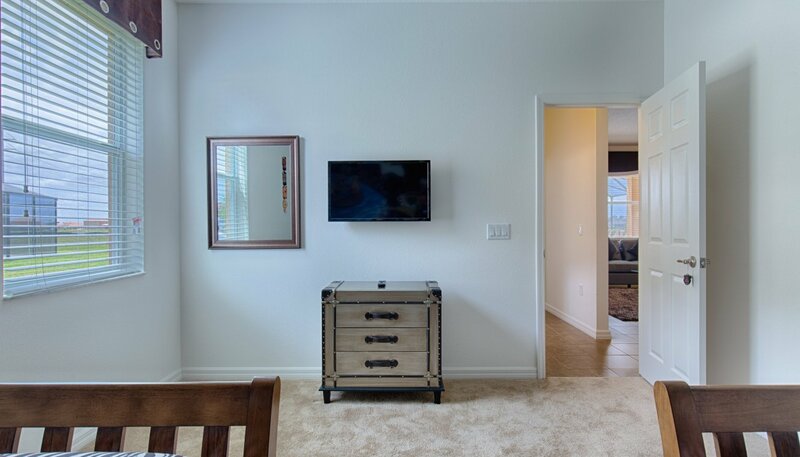 There are 2 matching nighstands, chest of drawers, chair, built-in wardrobe, and wall mounted flat screen TV. 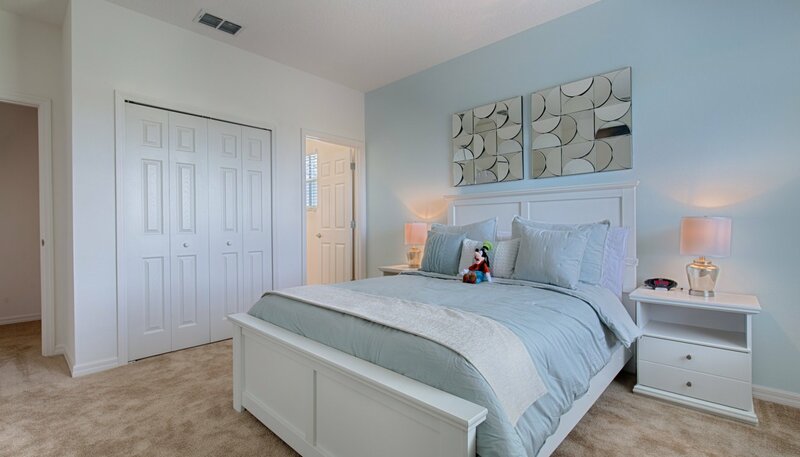 This bedroom is themed around Disney's Animal Kingdom park. 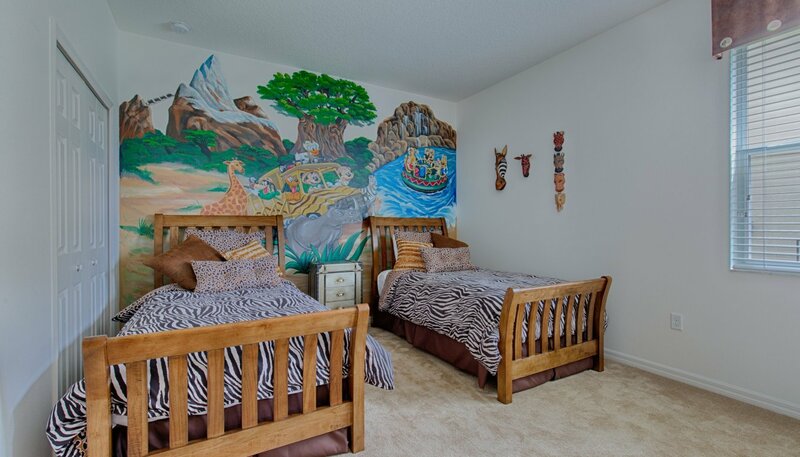 With a hand painted full wall mural, framed Jungle Book print, and reversible leopard/zebra bedding on 2 twin sized beds, this room is perfect for young adventurers. With safari luggage shared nighstand and chest of drawers, built-in wardrobe and wall mounted flat screen TV. 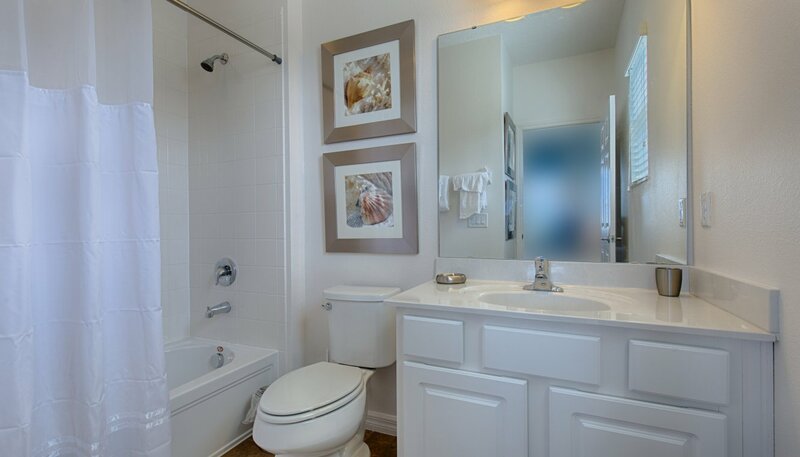 Situated between bedrooms 2 & 6 is the family bathroom which has a bath with shower over, WC, built-in sink unit and a hair dryer. 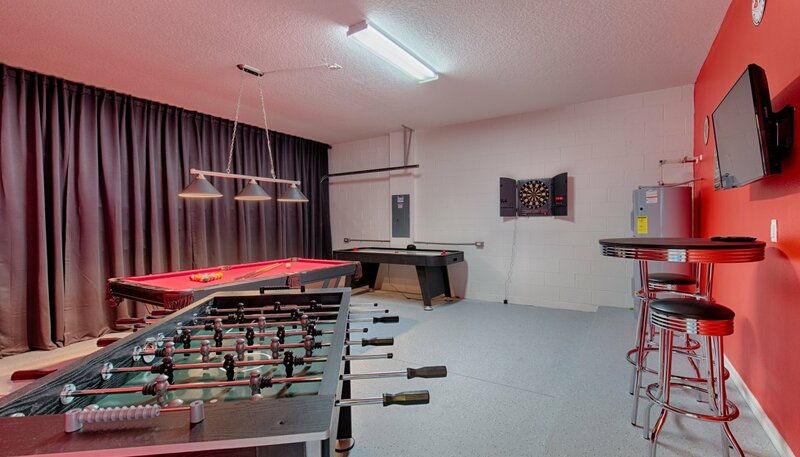 The garage has been professionally converted into a fantastic games room. With the walls painted and adorned with retro wall art, a thermal curtain across the garage door gives a much more attractive feel to the room and with the benefit of the air conditiong unit, it can be enjoyed at any time of the day, all year round. 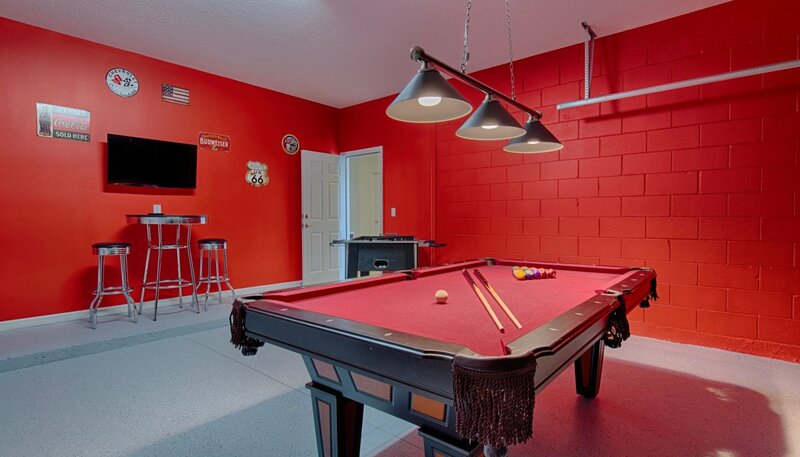 You can enjoy a game of Pool on the 7' table, Air Hockey, Table Foosball or Darts. There is simply everything to entertain all our guests. 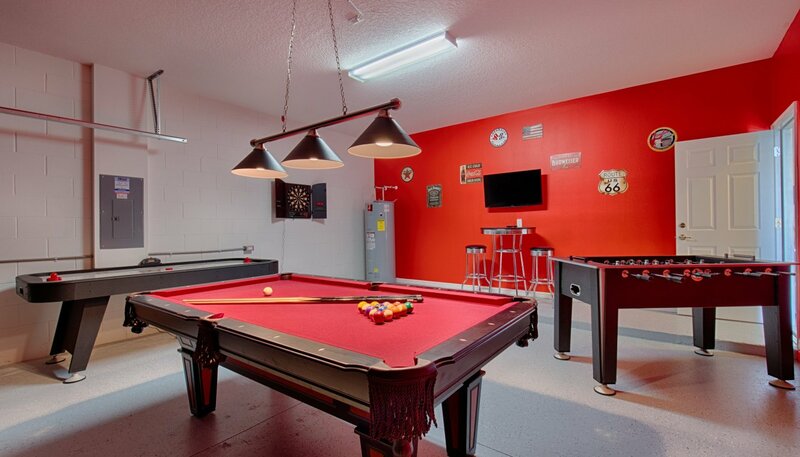 Why not have a family games competition and those not playing can enjoy a drink sitting on the stools at the bar table watching the wall mounted flat screen TV. The large sunny extended 30' x 15' pool with south west facing extended deck (40' x 30') benefits from splendid open conservation views with no rear neighbours. We have provided 8 very comfortable sun loungers for your sun bathing comfort and a patio table with 6 chairs under the shaded covered lanai. 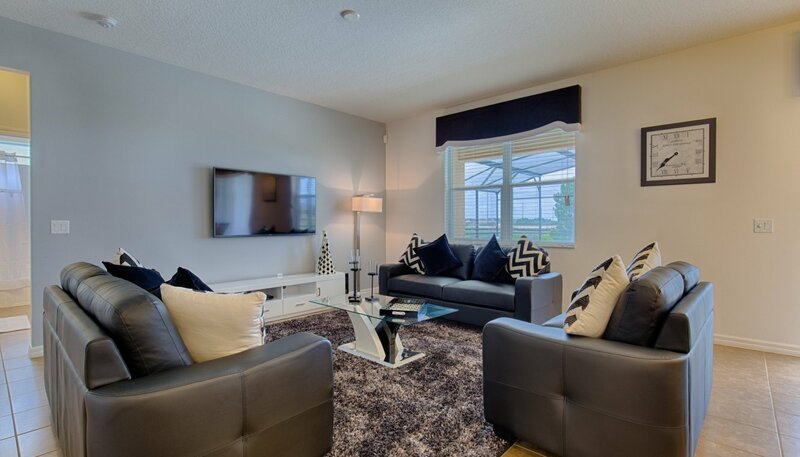 There is also further cushioned seating with a chair, settee and foot stool alsounder the covered lanai. The pool can be heated at an additional charge and this is recommended between October and March and there is also a pool cover to retain the heat in the evenings during the cooler months. For the ultimate in alfresco dining experience, our property management comapny will deliver a fully cleaned and fuelled BBQ grill for $64/week - please request this in the booking form. We have two cribs/playpens, a high chair and three strollers available at the home. There is no additonal charge for the use of these items. 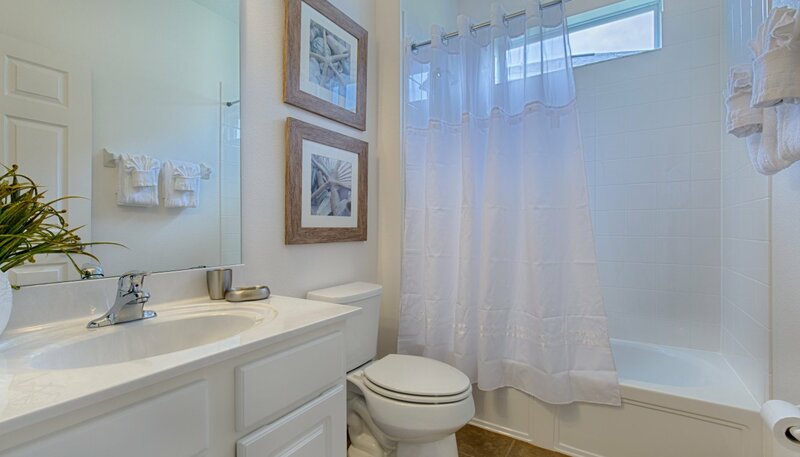 Our property management company has a "Laundry Room" facility where all towels and linens are taken from the home and professionally washed, sanitised and pressed to a hotel type standard. This standard is impossible to get when washing the linens in the house. Due to this service it means we cannot provide towels to be used by the pool or on the beach (the loungers are comfortable enough that you dont really need towels) so you would either need to bring your own beach towels, but would recommend you buy them when you are here as these can be picked up very cheaply locally. Our home features a fully monitored alarm & smoke detector system linked to the local police & fire department for your security and peace of mind. Our villa is maintained by a very responsive and friendly management company located close to Providence. This ensures that all our guests receive the most efficient, friendly and personal service 24/7. In place of a security deposit, we charge a one-off $55 non-refundable insurance premium in addition to the rental costs quoted on the website. On confirming a booking we will add the premium to the money owed and advise of this by email. It is less than a 20 minutes walk (3 minutes drive) to the Providence Golf Course and the excellent resort clubhouse. As well as the Michael Dasher designed par 72 championship course there is a driving range, putting green and Pro-shop. With two communal pools, including an olympic size lap pool, gym, tennis courts and children's play area there is an array of things to do. The huge master bedroom with views overlooking the front gardens, has been furnished with a luxurious king sized bed, matching nightstands and chest of drawers. A matching leather settee and ottoman/footstool bring an element of luxury to this stunning room and there is also a wall mounted flat screen TV. This suite also boasts a massive walk-in wardrobe with loads of storage space. 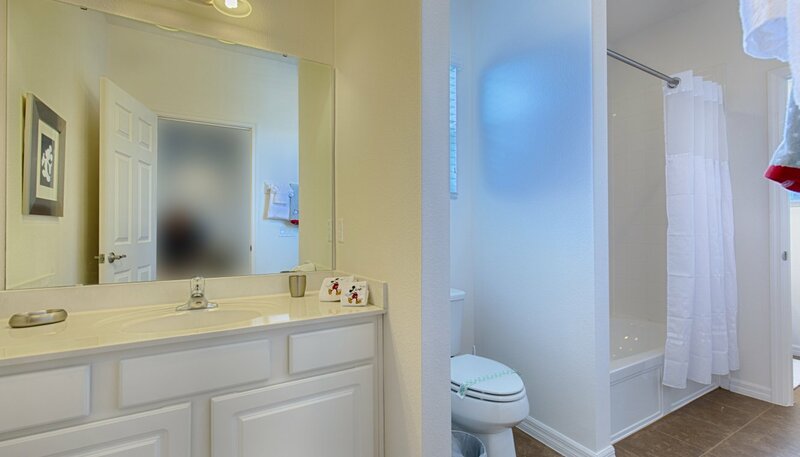 The connecting spacious en-suite bathroom has a large walk-in double shower, his & hers sinks, separate WC and a hair dryer. 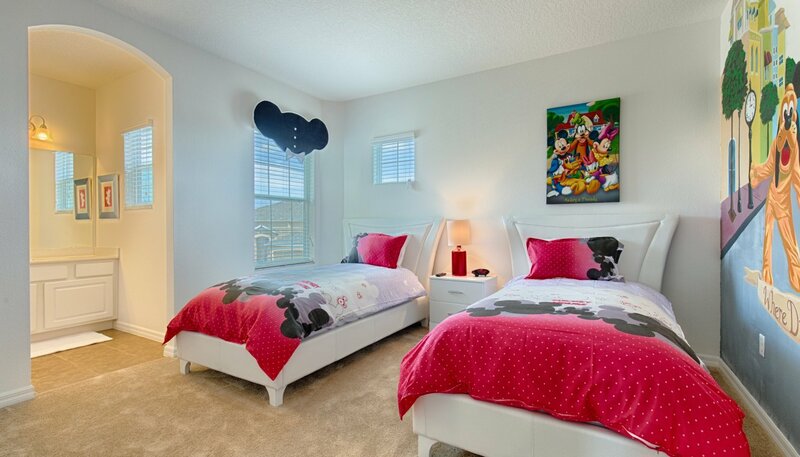 This ensuite bedroom is the Magic Kingdom themed room. 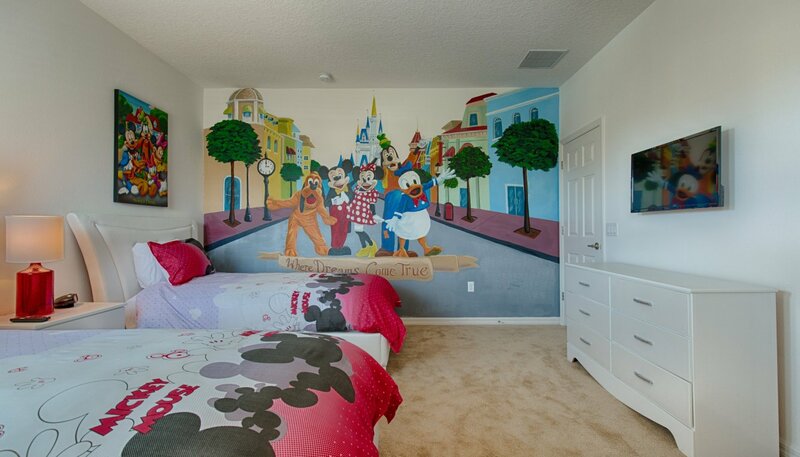 With a full wall mural depicting the characters on Main Street and the words "where dreams come true", Mickey Mouse bedding and window dressing this is the perfect room for young ones. Equipped with 2 twin beds, light coloured matching nightstands and chest of drawers, walk-in wardrobe, wall mounted flat screen TV. 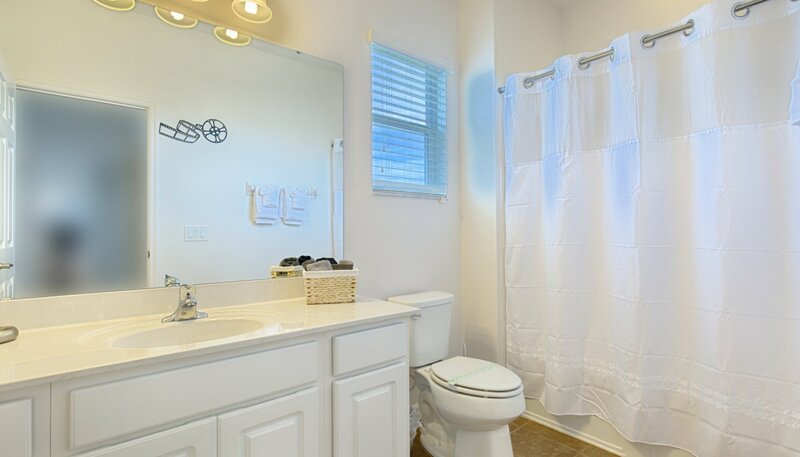 The Jack & Jill shared ensuite bathroom has a bath with shower over, single vanity and WC. 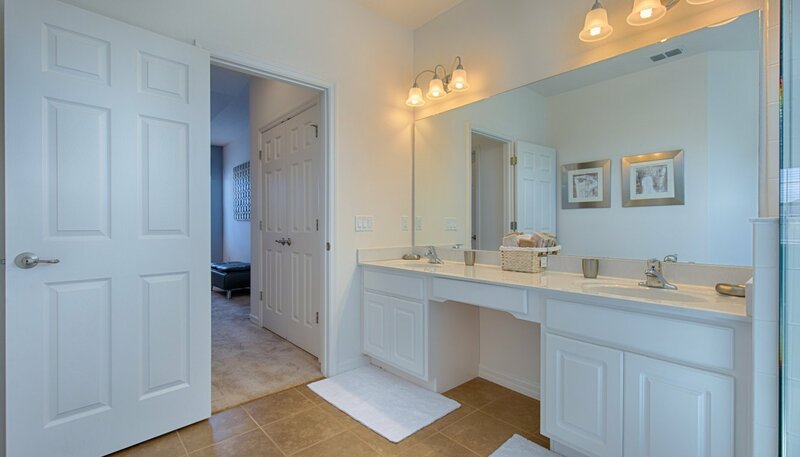 There is a second single vanity directly accessed from bedroom 3. 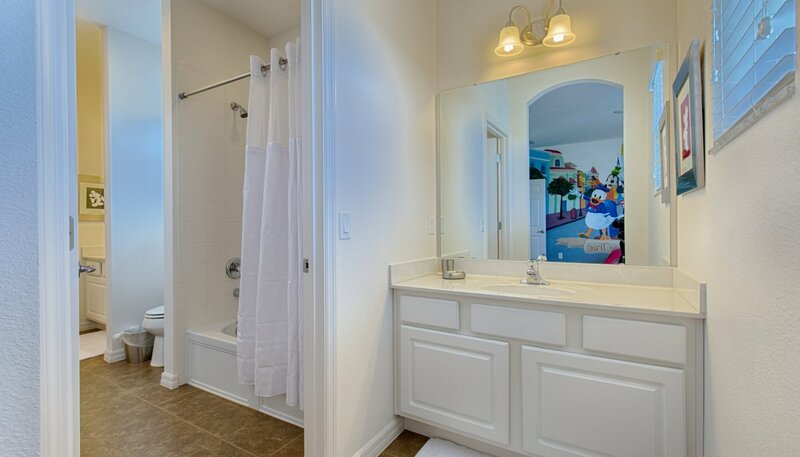 A hair dryer and Disney pictures complete this fantastic bathroom. 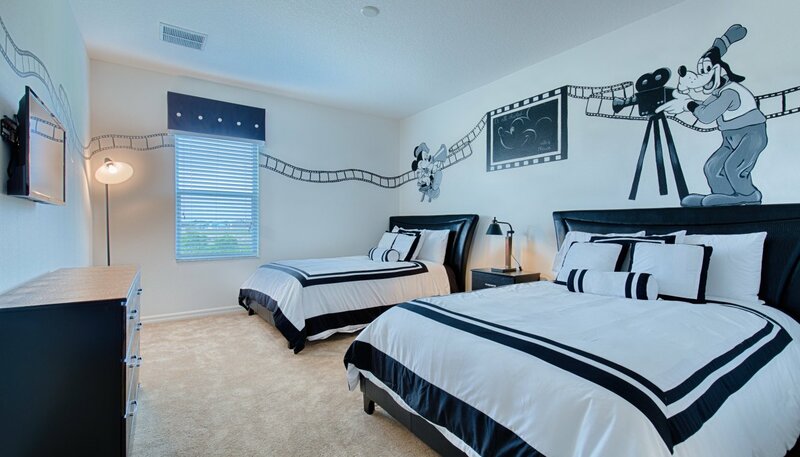 This ensuite bedroom has a vintage yet contemporay feel as it is based around the Hollywood Studios theme park and depicted in black and white. With hand painted Mickey Mouse as Director, Goofy as Cameraman and a film screen stating "It all started with a mouse" this room is a firm favourite with our guests. A hand painted film reel runs all around the top of the room and with stunning black nightstand, chest of drawers, a Directors chair with film style lamp and 2 double/full size beds built-in wardrobe, and wall mounted flat screen TV its easy to see why. This room can sleep up to 4 children. The ensuite bathroom has a bath with shower over, single vanity and WC, the continued film theme with tasteful wall art and a hair dryer. 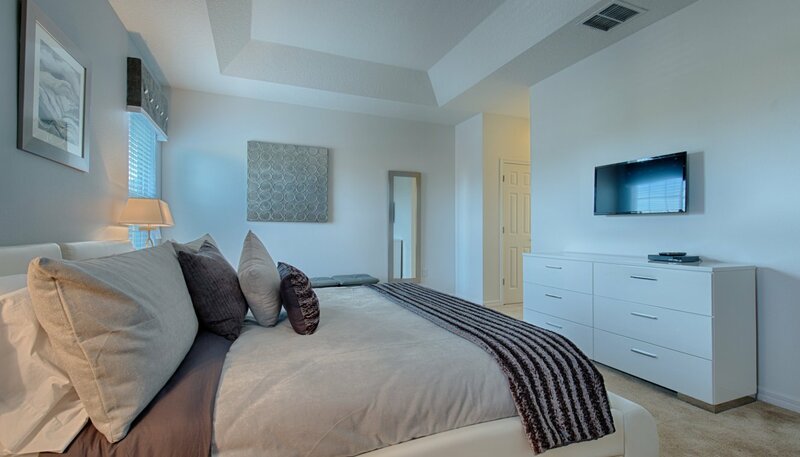 The fifth master bedroom has a queen sized bed, with matching nightstands, chest of drawers, built-in wardrobe and wall mounted flat screen TV. 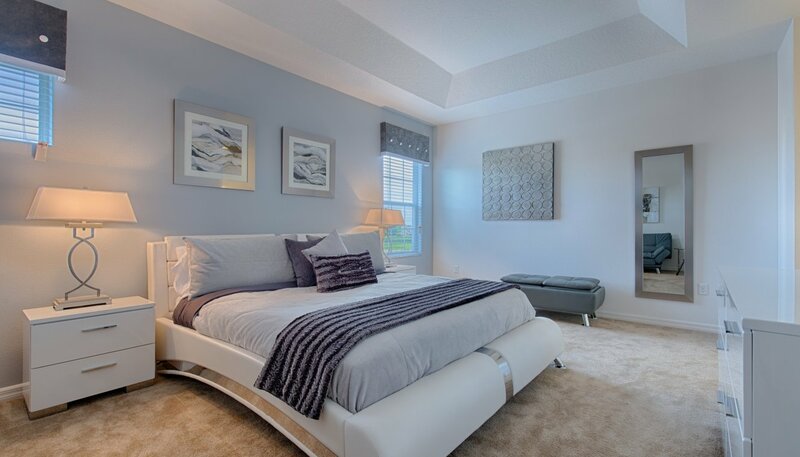 Decorated in soothing pastel shades with complementary furnishings this is a peacuful, relaxing bedroom. 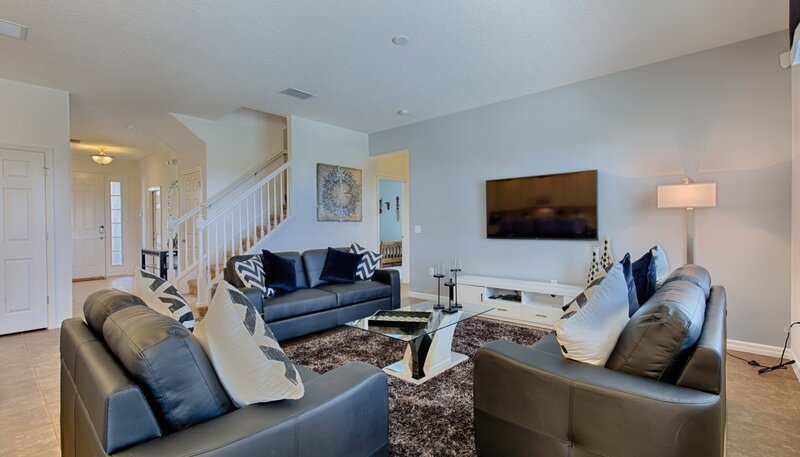 Situated at the top of the stairs this huge stunning area is a great place to watch a family film or play on the PS4 and enjoy on the 60" Smart 4K Ultra HD LCD TV. 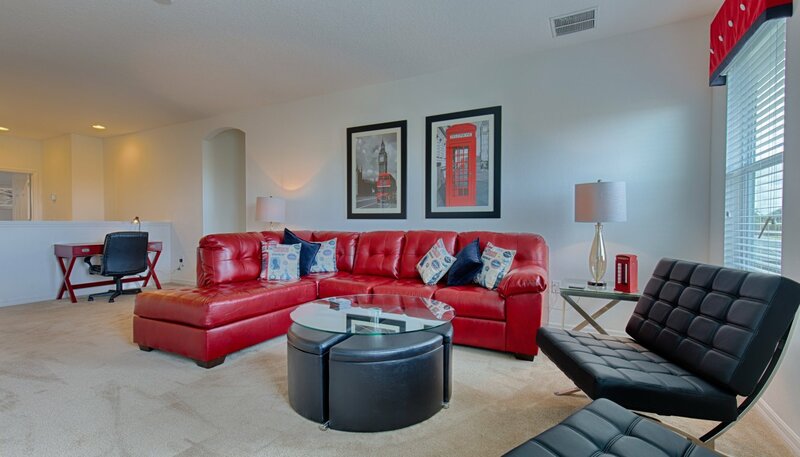 A sumptuous red leather sectional suite, two black Barcelona leather chairs and a table with 4 stools providing plenty of seating. With cool pictures, double decker bus, telephone box and classic Mini ornaments a touch of London is brought to Florida. A desk with lamp and leather chair gives a place to plan activities or catch up on emails. My family and I have just returned from two weeks holiday in Orlando and we stayed at Coconut Palm 5. I cannot recommend it highly enough. 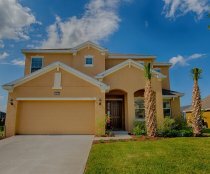 There are thousands of holiday homes for rent in the Orlando area but what sets this home apart from the rest is the attention to detail. When you spend time at the parks, outlets or beaches (which we did! ), it's great to come home to a villa where you can really relax. As you can see from the photos, (yes the rooms are exactly like this) there is so much space here but it's the decor which sets it miles above the competition. My kids and parents in law who travelled with us had so much space to go to if they or we needed a little quiet time. And you felt you were living in great comfort the whole time. We, including the kids looked forward to returning here after a busy day. Whether it's to read a book, use your iPad, play pool, fussball, air hockey or splash about in the pool, this place has it all. The wifi signal is great, the tv's are amazing and PS4, games and dvds were an added bonus. One of my kids had a birthday when we were there and the owners even left her a card and a Goofy plush toy for her! The owners, Martin and Julie, are a pleasure to do business with and we look forward to visiting again. 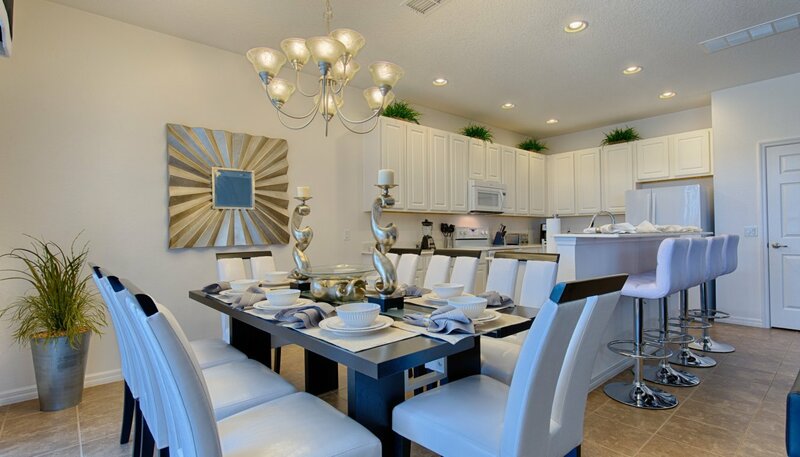 Really, if you are looking to rent a holiday home in Orlando, you will do well to find one as good as this one. You know sometimes you see the pictures posted by the owners and you think "are these real?". Well we can say yes to the ones posted for this villa by Martin, everything was as the pictures stated, this was an amazing place kitted out to the highest spec expected. Everything seemed brand new (just like our hire car which had 6 miles on the clock) as it is very well looked after. There is enough space for adults and the kids to hang out and do their own things. 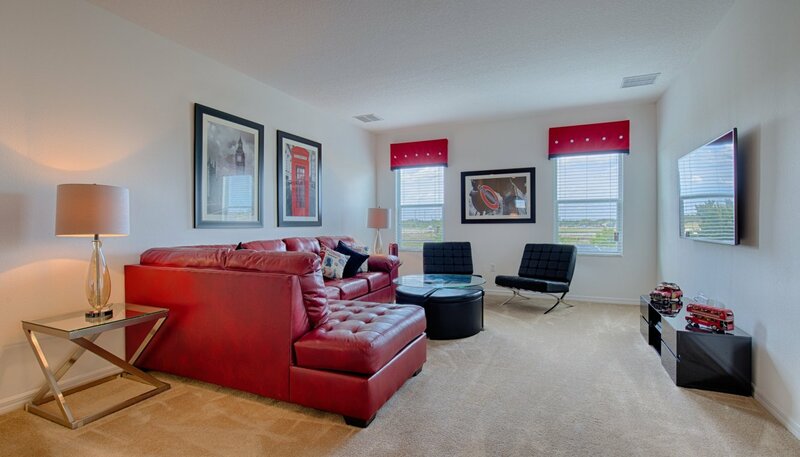 Totally peaceful and quiet neighborhood with easy access to the I-4 and Champions Gate for restaurants. All we had to do was stock up with food and then everything else was there a perfect home away from home. We had requested pool heating and this was perfect as we visited in December for Christmas. After some long days out it was always a welcome thought that we would return to this great place to relax. Communication with Martin was excellent throughout and we even contacted whilst we were out there with no issue. Book it you will not be disappointed.